John had the privilege of growing up in a Christian home. During a church revival service, at age 5, John asked his parents how to be saved. However, it wasn't until his first year at Piedmont Bible College that he realized he didn't have a personal walk with the Lord. In the fall of of his freshman year, John decided to stop trying to earn his salvation and fully trusted Christ for the first time. During his childhood John had the chance to meet and interact with many missionaries. God used these early experiences to give him an interest in missions. During his time at Piedmont, the Lord used godly speakers, mission conferences and mission trips to confirm God's calling and to give him a burden for lost souls around the globe. John spent a summer on a mission trip working with several missionary families in Peru. This trip opened his eyes to Peru's great spiritual needs. He returned to Piedmont for his senior year with a new vision and a plan to serve the Lord in Peru. John graduated from Piedmont with a BA in Bible and was then ordained in 1999. Debbie grew up in a home where ministry was important. Her grandfather and father worked together in ministry and started several city "rescue missions." Debbie was blessed with the opportunity to attend Christian school. She had heard the Gospel her entire life but didn't apply it to her own needs until she attended a summer camp her senior year of high school. After trusting Christ, her grandparents encouraged her to take one year of Bible at Piedmont Bible College. That one year turned into four as the Lord worked in her heart giving her a desire for service. She planned a summer mission trip to Scotland where she worked with a single lady missionary. God used that trip to confirm His calling in her life for missions. Debbie graduated from Piedmont with studies in Bible and missions. John and Debbie met during their time at Piedmont. God showed them how they could work together to serve the Lord on the mission field to reach others with the Gospel. After graduating from college they were married and soon joined Baptist Mid-Missions. After one year of language school they arrived in Peru where they spent nearly 14 years as church-planting missionaries. 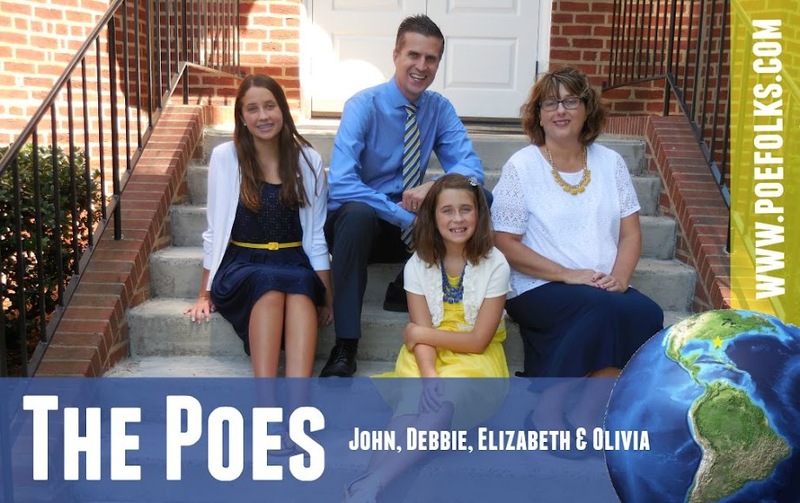 During language school in South Texas God blessed the Poes with their first daughter, Elizabeth Grace. Then during their first furlough to the states God blessed the family with Olivia Joy. Elizabeth trusted Christ as her savior in August of 2014 during our furlough at a church revival service. Elizabeth is now in her senior year! She enjoys our time traveling, listening to music and running. Of course she also loves living a short drive to the beach and Disneyworld. Elizabeth has done a good job of picking up Spanish. Her favorite classes in school are Bible, History and Math. Her favorite foods are rice, squash, BBQ, and pizza. Elizabeth is now making plans for college...look out world! Olivia made a decision to trust Christ when she was eight years old. Her school teacher led her to the Lord! Olivia is now in the seventh grade. Like most teens, Olivia loves to hang out with her friends, and stay on her phone. She's pretty fond of Disneyworld too. Olivia enjoys volleyball and archery. Olivia still enjoys being outside and often does her homework sitting in the front yard. Olivia's favorite classes are STEM, science, history and Bible. Look for updated pictures soon....yes, these are really old now! We are faith missionaries with Baptist Mid-Missions sent by Union Grove Baptist Church in Lexington, NC. We began our ministry in Lima, Peru in 2001 and continue to serve reaching Latin America with the Gospel. 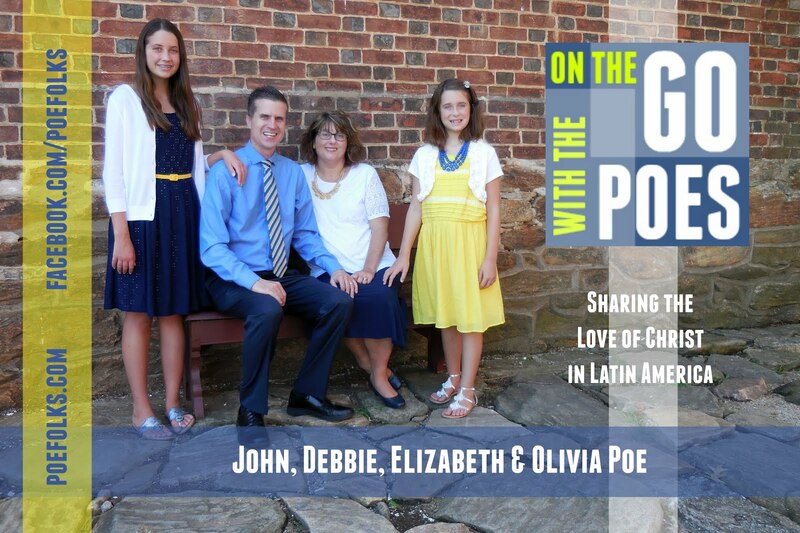 The Poe Family | Sharing the Love of Christ in Latin America | . Travel theme. Powered by Blogger.